Enter the abandoned fortress, track down the bandit spies, retrieve the treasure and collect the reward. But this simple task is only the first piece in a complicated puzzle, the first step in an adventure filled with intrigue and betrayal, where answers fade faster than ancient memories. As the larger picture comes into focus, the heroes realize that a more complex mystery is at hand, focused on far more than some stolen treasure. When allies become enemies and simple assignments become epic struggles, the characters will have to tread carefully as they navigate between deadly bandits and dangerous outcasts. Will the heroes act as unwitting pawns in this contest of wills, or will they succeed despite the odds and prevent the plague of dreams? 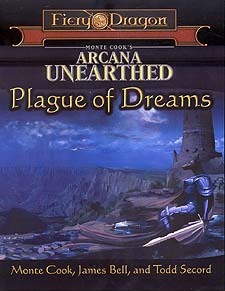 This adventure requires the use of Arcana Unearthed, and Dungeons & Dragons Third Edition Core Books.